Offering you a complete choice of products which include military leather belt, military web belt and military belt. According to the variegated necessities of our customers, we are putting forth an expansive accumulation of Military Leather Belt. Offered belt is correctly fabricated by making utilization of fabulous evaluation calfskin in a state of harmony with set industry standards with the assistance of present day systems at our very much prepared creation unit. Produced using calfskin, this belt from Contrast Accessories is fine in quality, adaptable and delicate. 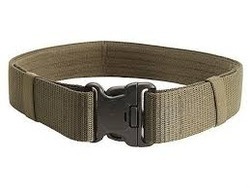 We export premium range of Military Web Belt that are widely appreciated all round the globe. Blended with high quality, comfort and style, they meet the latest trends. The entire range of our Military Web Belt bears high quality and can be availed at reasonable prices and have the following salient. Utilizing upon our top of the line planning office, we are putting forth an expansive cluster of Military Belt. We have very much prepared unit where we plan these belts utilizing preeminent quality nylon and multi fiber poly propylene materials. This Military Belt is refreshing among the clients the nation over because of its unmatchable quality and we are putting forth these items to our supporters at sensible rates.